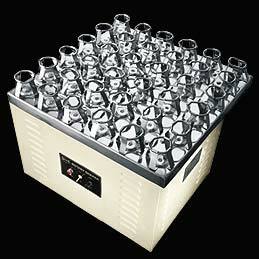 Putting forward another quality product in the deluxe model of Heavy Duty Rotary Flask Shaker, we feel immense pride. It has a continuous variable speed of 40 – 180 RPM. Fitted with S.S. platform & Lotus type clamp to hold flasks & Mechanical Timer 0-60 Minutes, stepless electronic speed controller controls it. In a horizontal plane, its closed body has a shaking amplitude of 25mm dia (1”). Details : Closed body having Shaking amplitude 25mm dia (1”) in a horizontal plane. Having continuous variable speed of 40 – 180 RPM & is controlled by stepless electronic speed controller fitted with S.S. platform & Lotus type clamp to hold flasks & Mechanical Timer 0-60 Minutes. Digital display of temperature and timer. Inner chamber,outerwall,boiler & steam jacket are mode of S.S.304 grade. Simultaneous display of temperature & time. Timer starts automatically as soon as the set temperature is attained & stops the cycle automatically as soon the time is over. The steam is to be released manually.